Tuesday we had a chance of snow, that never happened. But it stayed cold. (Funny, because all of the schools shut down and most businesses too. Even my office decided to close late Monday. I bet they wish they could take it back! Free off day!!! ) Then all of a sudden it was in the 60’s again! So we decided to make the most of it this weekend! 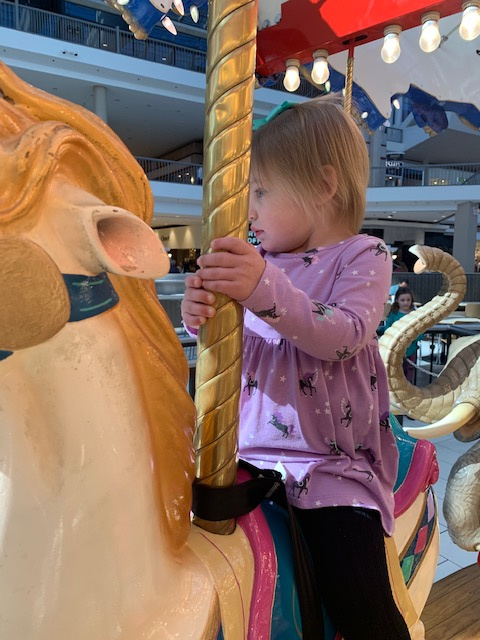 We took Zoe to the Galleria, a mall about 45 minutes away that has a Carousel in the middle of it. She was so excited when we could start to see it in the distance, and she took her time picking out the perfect horse. When it started to go, she was a little unsure and was gripping the pole so hard her fingers turned white. But then she was smiling and having the best time saying “Again! Again” when our turn was over. 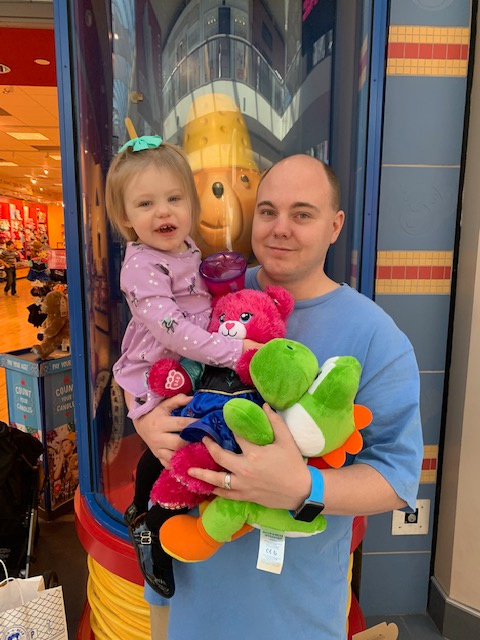 We walked down the hall to Build a Bear for another fun surprise. She had a hard time deciding which bear to chose. She started with a unicorn, then a troll, then my little pony, then back to a unicorn and a troll and then a paw patrol dog…and somehow we ended up with pink sparkly barbie bear. I made her stay firm in that decision because while we were looking, more and more people were filing into the store and then there was a birthday party going on. We ended up waiting for about 45 minutes to actually build her bear. But it was worth it to see her so excited to pick out her heart, and take her bear to the bath and chose an outfit. 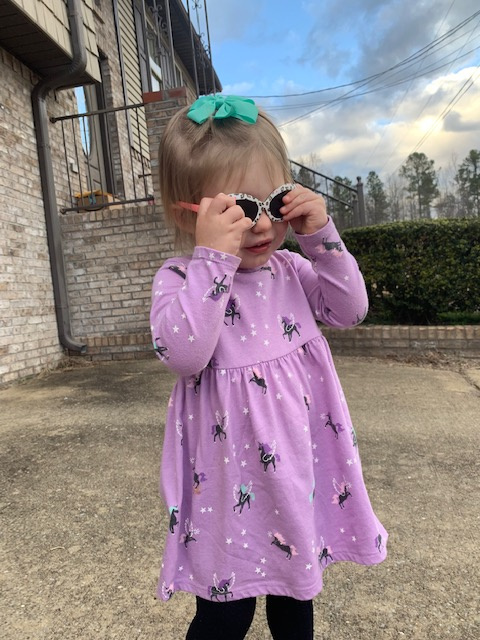 She went with an Anna dress, obviously. Chris decided to do a Yoshi too to add to our ever growing basement game collection. 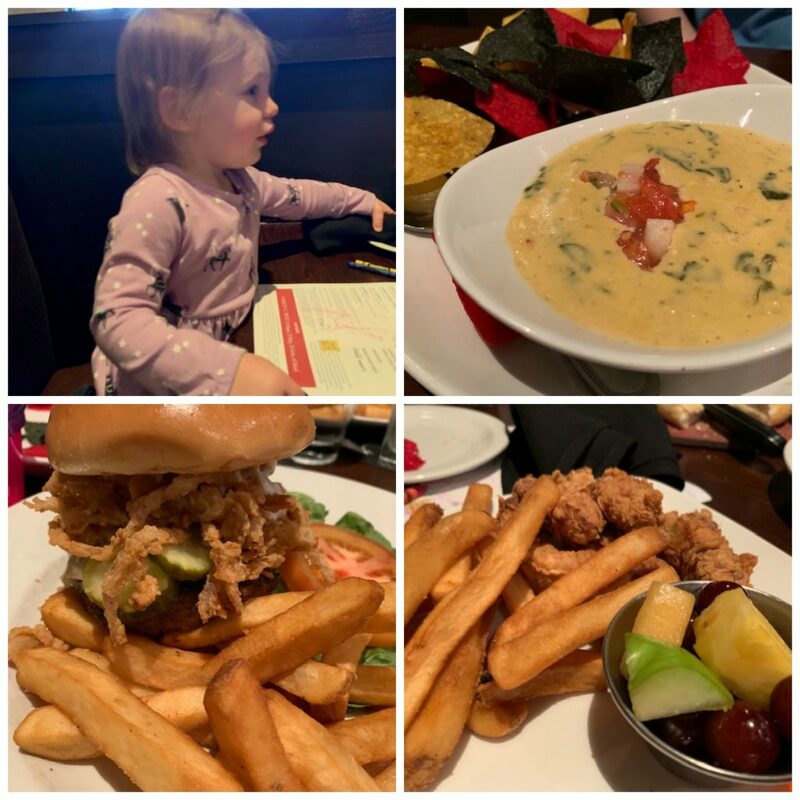 After that, we were all hungry and headed over to Firebirds for some delicious eats. We started off with some lobster queso, which was ah-mazing!!!!! Zoe ordered the chicken fingers and I landed on the Durango burger. Everything was so good!!! Zoe loves eating out and is always on her best behavior. When we got home, there was still plenty of daylight left, so we headed outside for some bubbles, sidewalk chalk and walks! Zoe living her best life! My sister and nephew came grocery shopping with us Sunday morning. Zoe absolutely adores both of them and is constantly asking about them through the week. Cooper plays really well with her, even though he is six years older. I think him being the youngest of four, with the next oldest in his family five years above him….he understands how you can feel left out a little bit. He is always so sweet with Zoe and never hesitates to play with “baby toys”. He is always bringing her his old books and stuff to keep too. I hope you all had a wonderful weekend! Linking up with Biana. I loved seeing Zoe in the merry go round in your stories!! I am so glad you all had a warm and sweet weekend!! This weather was amazing! I love all the pics of Zoe; so glad she had a fun weekend. Your nephew sounds like the sweetest thing! Her little face on the merry-go-round. LOVE IT. I’m glad you had a good weekend – hopefully we can all get on the same page and get to hang out again soon! Love Cooper – he was so sweet with Sheffield too. aww Z is so cute on the carousel! love it. and that is so sweet about Cooper. i can hardly believe this warmer weather a week after we got snow, i hope it’s here to stay! Those white finger tips – haha… at least she’s still doing it & smiling – adventurous little thing! Aw, what a fun weekend. 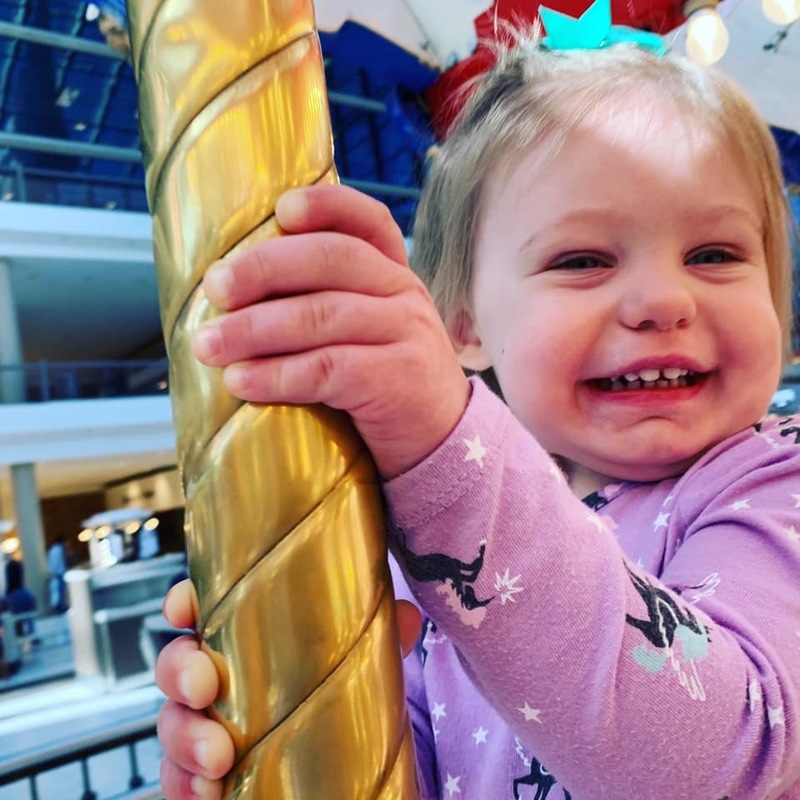 I’m glad that Zoe had fun on the carousel once it got going! The bear she chose is adorable. I’m sure it was a lot of fun for her to put together, if you will. And that’s awesome she’s so well behaved at restaurants!! Awwww your nephew sounds so sweet, that is really great that he plays so well with Zoe. The white knuckles made me chuckle, but you can see the excitement written on her face. The weather was glorious yesterday, enjoy! Score on getting a day off work for “snow day”. Aww. Zoe & Cooper’s relationships is so cute and special. What a good older cousin! Sounds like a fun weekend! Yay for a free day off! I can’t believe how cold it was last week across the US. Glad you got a day off. I still haven’t taken my girls to build-a-bear yet. I want to try that for my girls.